Philadelphia Phillies manager Gabe Kapler argues a call with umpire Jerry Layne. Three games into the season, the Phillies are the laughingstocks of baseball. In every corner of the game, the critics are rightfully rolling out the ridicule. “I’ve been to a rodeo and three goat-ropings and never seen things like this,” said Braves broadcaster Joe Simpson during a 15-2 Phils’ disaster in Atlanta on Saturday night. 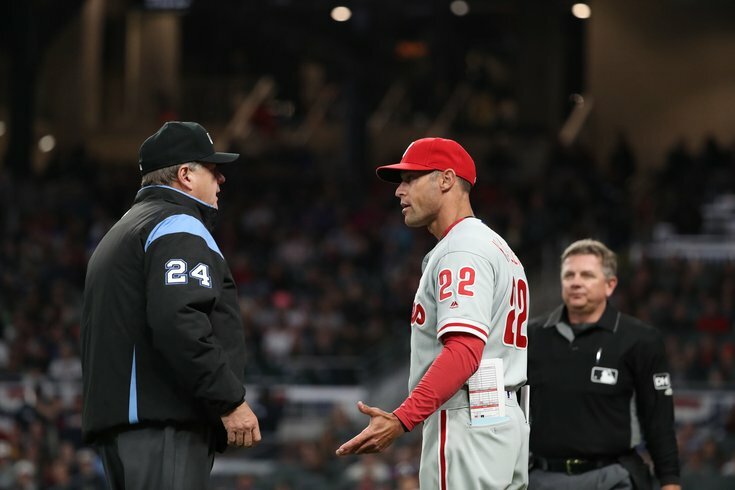 “Whoever is at fault for not doing their jobs on the Phillies’ side should have to answer to Major League Baseball,” said Jerry Layne, the crew chief who worked the game that night. “It’s an indication that I need to do a better job, and I will,” said Phillies novice manager Gabe Kapler. Based on the first three games, it is not too early to say that hiring Kapler was a colossal mistake by GM Matt Klentak, a gaffe rooted in the idiocy surrounding analytics. Most of Kapler’s mistakes in the first series of the season were a product of his obsession with statistics instead of simple common sense. For example, everyone except Kapler knew it was insane to remove ace starter Aaron Nola after 68 pitches in the opening game with a 5-0 lead, but the manager liked the matchups better with Hoby Milner against the two best lefty hitters for Atlanta in the sixth inning. Of course, the decision backfired and the Phils lost the game, 8-5. And then the Nola move kept backfiring. Employing the same twisted logic the next night, Kapler used nine pitchers over 11 innings in a 5-4 win. Two games into the season, the manager had done the impossible. He had already burned out a nine-pitcher bullpen. The debacle in the third game was predictable. Vince Velasquez has never been known as an economical pitcher, and the Phils starter was done after recording eight outs on Saturday night, already trailing 5-2. Once again, the analytics suggested it was time to get Milner up, for the third straight game, to face the lefties. Except no one bothered to get Milner up – at least not until Kapler had already walked out to the pitcher’s mound to remove Velasquez. At that point, Milner had not even removed his warm-up jacket. He had not thrown a single pitch in the bullpen before Kapler waved him in. That’s when insanity took over. Braves manager Brian Snitker was ejected when he pointed out, accurately, that Milner spent 90 extra seconds trying to warm up before he emerged. The umps limited Milner to five tosses on the mound, instead of the usual eight, but the damage was done – especially to Kapler’s reputation. The rookie skipper, who had only one season of managing experience before Klentak hired him last winter, later made the situation worse by implying that someone on his staff was guilty of the screw-up. Oh, he said it was his responsibility, but it doesn’t take an analytics expert to read between the lines. Milner said he thought there was confusion between pitching coach Rick Kranitz and bullpen coach Jim Gott, but it was Kapler who marched out to the mound, not them. At no point did he even glance at the bullpen to make sure his relief pitcher was warming up? Kapler was right when he said it was his fault. He is so immersed in the minutiae of the game, he is missing the most obvious things. When Klentak hired him, Kapler was presented as a new-wave manager, a deep thinker who had new ideas on how to manage the game. It’s safe to say this new wave did not include using 21 pitchers in the first three games, one of whom (Pedro Florimon) is actually a utility infielder. It’s also safe to say that Kapler’s exploits already are giving pause to teams around the league that have sold their souls to the analytics gods. There is a point of no return with this madness. We just saw it in the Phillies' first three games. And let’s not ignore a basic principle of professional sport: the games should be entertaining. With Kapler over-managing, the first three contests consumed – ready for this? – 11 hours and three minutes. During Friday night’s 11-inning marathon (4:16), I toyed with developing my own analytics to gauge why a tie game was so boring. Finally, with the Braves coming up to bat in the 10th inning, well after 11 o’clock, I shut off the TV and went to bed. After what happened the next night, I am now aggressively seeking other forms of entertainment. Has anyone ever been to a goat-roping? When Joel Embiid crumpled to the floor last Wednesday night after a brutal collision with Markelle Fultz, the worst fear of a rejuvenated fan base became real again. The franchise center was hurt – for the fourth straight season – and the Sixers’ prospects in the playoffs were in immediate peril. The sad truth is, two far more important issues evolved out of that mishap and the ensuing medical treatment for a concussion and a fractured orbital bone. Whether Embiid will be able to rejoin his team for the first round of the playoffs remains in question. What is no longer debatable is the great young player’s predisposition for injury, and for the competency of the medical staff that is treating him. Those are the two biggest concerns now. I know, I know. This is not the first time I have placed the focus on the doctors overseeing the Sixers. Hey, somebody has to, don’t they? The Sixers have taken dramatic strides toward respectability this season on the court and – with a current win streak of 10 – have developed a far deeper roster than just Embiid. Ben Simmons is the NBA rookie of the year. Dario Saric has become a major contributor. J.J. Redick is the veteran leader and outside shooter they have needed for years. And even Fultz shows some signs of progress, after a rookie season from hell. Still, they are a year – probably two – away from being the title contender that four years of tanking should, and has, produced. With or without Embiid, the Sixers will hold no parade down Broad Street this year. If Embiid cannot find some way to make it through an entire season without a major injury, this group of talented young players may never have that moment. Remember, he missed his first two seasons with a broken foot, had knee surgery that abruptly halted last season and now he’s out with two different head injuries. Is he injury-prone or unlucky? Not good, indeed. And that goes doubly for the medical people who continue to mismanage the fragile health of Joel Embiid. • How does coach Jay Wright keep winning the way he does at Villanova without ever hitting a false note? He expressed actual discomfort with the way his team dismantled Kansas on Saturday night, and I believed him. Wright said his team just couldn’t miss a shot, and some nights are like that. Imagine that – a believable apology for being too good. Is anyone, other than Michigan, not rooting for Wright tonight? He is the nicest man in college sports. • The best story of the week, if not the year, was accountant Scott Foster taking over as the emergency goaltender last Thursday and playing the last 14 minutes of a Chicago win. Foster was supposed to be goofing off in a ragtag beer league that night, but injuries forced him onto an NHL roster and then into the game, where he stopped all seven shots he faced. Is it too soon to ask whether an accountant is better than anyone the Flyers have in net right now? • I was ready to call for the immediate release of Michael Bennett ... until Houston commissioner Art Acevedo opened his mouth. The idea that, after a 14-month investigation of a five-second incident involving Bennett and a paraplegic security guard, the cop could call the new Eagles’ defensive end “morally bankrupt” and say he would “arrest him on the street” was irresponsible. Now I agree with the Eagles. Bennett is innocent until proven guilty. And, given the stupidity of the top cop in Houston, my money is on innocent. • Markelle Fultz has shown some flashes of the talent that made him the No. 1 pick in last year’s draft, but he needs a lot of work on how to answer questions in a demanding sports city like Philadelphia. His silence after questions about a shoulder injury that kept him out most of the season was embarrassing. Granted, he’s only 19, but he should have been ready to explain what he was dealing with. Let’s just hope the kid finds his shooting form, and soon. • Congratulations are in order for Maurice Cheeks, the exquisite Sixers point guard who finally was voted into the Basketball Hall of Fame last week, 25 years after his last game in the NBA. Cheeks refused all efforts to launch a campaign on his behalf, saying it would not be the same kind of honor if he achieved it that way. Typical Mo. There has never been a more honorable star in Philadelphia sports history than Maurice Cheeks.